EricG posted this wonderful picture of Shackleton 1722 on Airliners and indicates that it was taken in October 1993......but where?? Have a look at both ends. Anybody know what Pietersburg looked like? 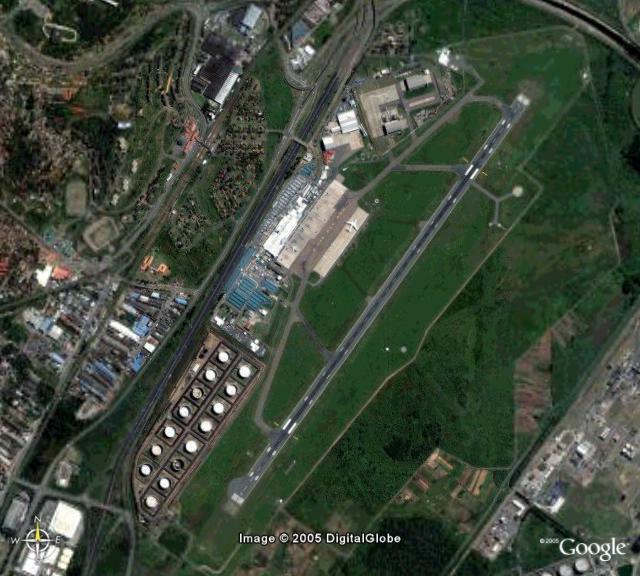 To me everything in the aerial picture of the runway, points to it being that of the old Louis Botha Airport, Durban. The upper part of the picture is the threshold of Runway 23 and the Buildings to the left are the Hangars and Buildings of the old AFB Durban, including the vehicle parking area outside of the Entrance Gates to the Base. At the other end of the runway are the Oil Storage Tanks which are located to the West of the Threshold of Runway 05. In the centre on the Western side of the Runway are the Terminal Buildings and hardstand. Hmmm not so sure ... the rwy sign just above the wing doesn't look like 08 - second digit looks more like a 9 to me. Anyone have better tools to zoom in and sharpen that part of the mage? I also thought it was old 08 in PE .... but not certain anymore. For me the big clue is the mowed grass .... what airports in SA have/had such manicured grass .. old Durban ? Agree, not Port Elizabeth......... anyway, lived in PE for thirty years and never saw grass as lush as that at the runway. So agree...PLZ 08 is "OFF THE TABLE"
my next suggestion is CPT runway 16 ?? ?